Truth should be told, in terms of technological progress, US online casino market is 2-3 years behind EU/UK casinos. While in Europe and UK, newly launched casinos don’t even offer a download version, many instant play casino USA sites are truly horrible. They are messy, difficult to use and offer very limited variety of games. That’s a pity, since flash online casinos are without a doubt the future of online gambling. They are more simple to use, can offer games by endless number of game developers and most important, can be played on all devices – desktop, tablet and mobiles. But, there is a light in the end of the tunnel. Slowly we can see more and more solid USA flash casino sites for players to enjoy. You can find them here. And if you are still not sure what is the right choice for you, you can check our guide on No Download Casinos Pros & Cons (below the table). Instant play casino, also called no download casino, are casinos that allow you to play casino games for real money and for fun, in your browser, without downloading any software. You can play using almost every browser, Chrome, Firefox, Internet Explorer, Opera, Safari, etc. Simplicity: The obvious advantage is that you do not need to load any software on your computer. Why should you? The internet connection becoming faster and faster every year and there is simply no reason to download any software. Safety: instant play casinos are much safer. Personally, I always try to avoid downloading some software on my PC. Why should I worry about downloading some virus when I can get the same result risk free. Game variety: flash casino can offer games by multiple software providers – so you won’t have to play the same slots over and over again. Now we don’t mean that all of them are indeed multi software casinos, but the good ones are. 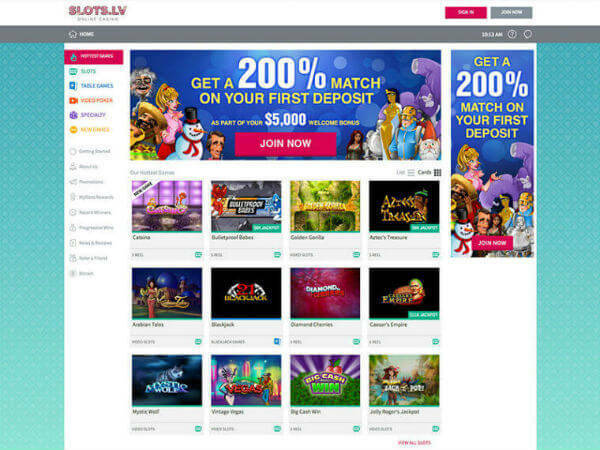 For example in Slots LV (see the image below) and Ignition casino you can enjoy games by 3-4 different providers. Suitable for all devices: download casinos are good only for laptops and PC’s. Whether you wish to play on mobile, Mac, PC or all together – you can. That’s the main reason why download casinos will soon be forgotten and instant play and mobile casinos will rule the market. Confusing and non-friendly: if you’ve been playing online, you probably happened to sign up to online casino using the instant play mode, only to find that it takes you two hours to find where the cashier is, how to switch games and so on. And then when you finally ready to play, the slot is getting stuck and you need to reload the casino. The reason for that is that many casinos still neglect the instant play and focus on the download version. On their site they do have the “Instant Play” button, but no sane person can really play there more than few minutes. Low variety of games: Some casinos offer 200 different games using the download version and less than 60 using the instant play mode. This is particularly true to single software casinos, such as most RTG and Rival sites, where many games weren’t transformed to flash mode. Of course multi-software sites solve this problem by offering games by variety of slot developers. Bottom line is that despite the fact that US gambling companies lag behind the rest in terms of instant play, flash and for sure HTML5 adoption – there are still some solid instant play casinos for you to enjoy. Have Fun!